We realized this more and more, everytime we mowed it with our push mower this summer. We knew when we moved in that it was big....but we thought it would be no big deal to mow it once a week or so. 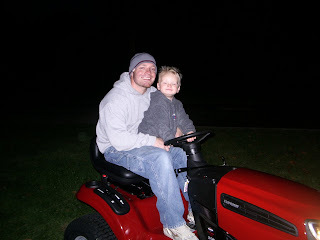 We thought everyone on our street was crazy for owning a riding mower. They all have yards about the size of ours. 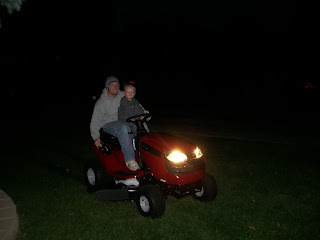 We decided that since it took almost 2 hours to push mow our entire yard (and hours and hours of raking leaves and such) that it was time to join the club of lawn tractor owners. Boy, does buying at the end of the season bring great deals, too....if you have read any of my previous shopping posts, you know I am a big bargain hunter! 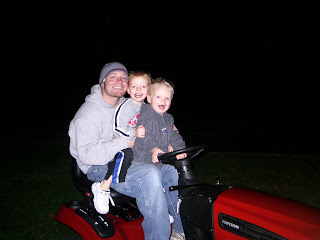 So, Shane got a new toy, and the boys got their first ride the other night. I even got to bag some leaves the other day! It sure was a lot more fun than raking it by hand--I think I may actually even look forward to the task of mowing now!